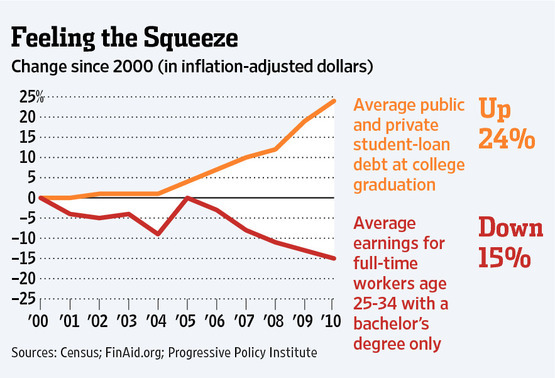 The Wall Street Journal recently published an article about the problem of student loan debt. The graphic below sums up the issue in a powerful way. As student loan debt has increased dramatically over the past decade, salaries of young adults have also fallen. I was recently interviewed about this issue by a local TV News station. After the camera was turned off, the reported explained that she had $96,000 in student loan debt. She is 30 years old and her monthly student loan payment is higher than my mortgage payment. This is clearly a significant and growing problem. As the cost of college has increased exponentially over the past twenty years – by more than double the rate of inflation – it takes more of a family’s income to pay for college than ever before. So naturally, parents and students turn to loans. Since many parents have run out of home equity on which to draw, they pass the loan burden on to their children. While this may seem like an intractable problem, there is a solution, one which many families won’t enjoy reading. Stop overpaying for college! In the same way that debt counselors tell consumers to cut up their credit cards, I advise my clients to stop taking on unecessary debt. I recently told a client with significant debt issues not to send their son to his number 1 college choice as it was the most expensive option of the 8 schools to which he was admitted. This family was considering taking out $160,000 in loans to pay for college, when they could have opted for their cheapest option at a total cost of about $68,000 over 4 years. By the way, lest you think that public universities are always the lowest price option, that was not the case in this instance. The first school mentioned above was a public university. The second, lower priced option was a private, liberal arts college! The key is to strategically and systematically search for colleges at which your child will be an appealing applicant. This means different things to different colleges. Some schools want and need world class athletes; others seek strong academicians. Still others are seeking “geographic diversity,” and the list goes on. The more colleges value the applicant, the better the aid and scholarship packages will be. See the graphic below, and then avoid that situation at all costs!